The 2013 Chevrolet Volt hasn’t received any huge changes since being introduced a couple years ago but the few subtle changes made for the 2013 model year only serve to make the best affordable electric vehicle sold in the US even better. If you were to look at a collection of 2012 and 2013 Chevrolet Volts all painted black, there is a very good chance that you couldn’t pick out one model year from the other. The only changes for 2013 are the removal of the black roof and rear hatch trim in place of body colored panels (which is why you wouldn’t notice the difference with a bunch of black Volts) along with a new drive mode that caters to those Volt drivers who spend lots of time on the highway. The subject for this review was a 2013 Chevrolet Volt in Silver Topaz Metallic with the Pebble Beige interior which carries a base MSRP of $39,145. My test car also featured the Premium trim package that adds leather heated seats, a leather wrapped steering wheel and the removable rear armrest for $1,395, enhanced safety package 1 which adds an auto dimming rear view mirror, rear park assist and a rear view camera for $575, the enhanced safety package #2 that adds front park assist, forward collision alert and lane departure for $595, the Chevrolet MyLink radio with navigation for $895, polished aluminum wheels for $595 and the Bose sound system for $495. The final price of my Volt test car was $44,545 with the $850 destination fee and while that is a hefty chunk of money, buyers are subject to the $7,500 tax credit along with local tax credits that can chop another $2,500 off of the price in certain areas. Also, the 2014 Volt has an MSRP starting $5,000 less so this exact car for the 2014 model year would come in under $40k. On the other hand, the Chevy Volt has a smooth, fashionable exterior design that could just as easy work on a non-EV or non-hybrid model. While the overall exterior design is clearly unique, with a highish back end and a super slippery greenhouse, GM has done a great job of designing an aerodynamic sedan that doesn’t emphasize the fact that this is an alternative power vehicle. Across the front end, the 2013 Chevy Volt has the same pretty face that was introduced a couple years ago. This includes a super sharp looking silver grille filler area flanked by high tech looking projection headlights mounted at an angle that presents a very sporty, aggressive look. Needless to say, “sporty” and “aggressive” aren’t adjectives used to describe many super efficient models on today’s market. Accentuating that sporty theme is contrasting black cladding that runs across the base of the front end and continues down the sides and around the back end. The Volt has a somewhat high hood line that meets the ultra slippery windshield before heading up over the long, gently sloping roofline and down the nearly non-existent trunk area created by the large rear hatch – which also has a slightly high sitting posture to improve aerodynamics. New for 2013, the roof of the Volt is finished in the same color as the rest of the body rather than black but as someone who has grown to like the contrasting black roof, I didn’t find the newly painted roof to be that big of a deal. At the same time, I’ve heard people complain about the black roof so this change for 2013 surely pleased some prospective buyers. Out back, another new feature for the 2013 Volt is the body colored hatch “face” where the Chevy bowtie and Volt logo are located. Like the roof, this panel was black on previous model year Volts regardless of the exterior color chosen and having this portion by body colored gives the back end of the 2013 Volt a little cleaner look. A low profile spoiler mounted at the base of the hatch just above the angular, high tech headlights really complete the sporty look of the Volt while secretly bolstering the aerodynamics of this electric Chevy. I love the looks of the 2013 Chevy Volt and I regard this car as being the best looking EV on sale around the US with a design that maintains some sporty character and great aerodynamics without looking like an egg cut in half. The Volt could have just as easily been a traditionally powered vehicle and it would have been just as poplar…if not more so with the lower price that would come with a vehicle lacking the high tech electric drivetrain. One area where I can see some consumers not loving the 2013 Chevrolet Volt is in the seating configuration. The Volt features a console that runs from the dash all of the way back to the cargo area under the rear hatch. Because of that, the Volt has an interior layout that is known in the sports car world as a “2+2” design with two seats up front and two seats in the back. Unlike many cars of this size that use a one piece bench seat in the back with two normal outboard positions and one miserably small center seat (that no average sized person can fit into comfortably), the Volt uses that generally unloved center seating area for a handy rear console with cup holders, an arm rest with a hidden storage compartment and a power source. This would be a disadvantage for a family of two adults and three kids but for my family of two adults and one kid – this design is fantastic. My kid has a place to stash video game accessories on a long car ride, some place to put a drink and even a place to charge his 3DS or cell phone during the drive. So some, losing the middle seat would be a hassle but for my purposes, this is a great many and a much better use of that space. More importantly, the Volt offers plenty of leg, hip, shoulder, elbow and head room for both front and rear riders. There is also a gigantic cargo area under the rear hatch that can be accessed from the rear seats while moving which is another great feature for a family using this car for a long driving trip. You can also fold down the rear seats and remove the rear center console storage box to create a cargo area as big as some sport utility vehicles. If you were to look into the interior of the 2013 Chevrolet Volt without looking at the center stack or the gauge cluster, the Volt might look a bit on the barebones side but the overall design of the Volt’s interior amenities presents a very clear layout. The two tone interior spread of my test car looked very upscale and clean with darker tones breaking up the majority of the interior that is finished in light brown. Of course, the area around the driver is anything but barebones with a leather wrapped steering wheel featuring buttons for the stereo, cruise control and Bluetooth hands-free phone system. Beyond that is an impressive customizable driver’s information center that displays the vehicle speed, electric range, overall range (including the use of the gasoline engine) and the efficiency coach – among other things. The efficiency coach operates by means of a bouncing green ball that gets smaller and turns yellow when you are applying too much accelerator or braking force and while it looks neat, it also works very well as I found that it very accurately guided the driver to get the best possible range. The center stack of the 2013 Chevrolet Volt is highlighted by the big, bright touchscreen that sits high on the dash and displays all sorts of useful information from navigation to the sound system display to a screen that shows the power flow and efficiency figures of the electric Chevy. The energy information shows when the gasoline engine is running, when the battery is sending power to the wheels and when the regenerative braking system is sending charging power to the battery while also allowing the driver to see how long the car will take to charge based on the current battery levels. Below that big touch screen is a frenzy of touch sensitive controls for the climate control, the stereo, the heated seats and the navigation system. I am someone who likes touchscreen controls and high tech gadgetry but when you are driving, these touch buttons are tough to use without looking to see what you are pushing and when you are poking blindly at the controls while driving, these sensitive button make it unfortunately easy to accidentally change the mode and such. However, you can control almost everything from the steering wheel or the touch screen so these buttons are more for the use of the person sitting shotgun and when you are able to look at these controls to use them – the functionality is seamless. These basically non-existent buttons provide for a super clean look but some people might not love them…but those are probably the same people who will complain about all sorts of touch sensitive controls found on modern vehicles. Finally, the center stack features the push to start button that glows blue, the push-pull button for the parking brake and the very traditional shift lever. For a prospective buyer who only needs 4 seating positions, the 2013 Chevrolet Volt interior is ideal in pretty much every way. There is tons of passenger space in the front and rear, convenient storage for all four occupants, a huge cargo area and a high tech control interface that is fitting of a car that is so technologically advanced. The Volt is comfortable, it looks great and it feels great so whether it is your daily commuter car or the vehicle that you will use to visit Grandma 500 miles away – the Chevy Volt is comfortable for the whole family. The 2013 Chevrolet Volt is pretty much unchanged from the previous model years with the same Voltec electric drivetrain aided by a 1.4L gasoline range extending engine. The only significant change to the functionality of the 2013 Volt is the addition of the EV Hold mode and while that addition doesn’t do much for the overall range or the MPG rating - it can make a big difference for a driver who commutes on the highway into a congested area. When the 2013 Volt’s EV Hold mode is activated, the range extending gasoline engine kicks in immediately to keep the charge level right where it is rather than waiting until the battery is depleted. This allows you to preserve your battery power until you want to be using it…like when you are stuck in slow moving traffic. For instance, when I drive into downtown Detroit, I get on the highway and drive about 35 miles before hitting the city. With the “older” Volt, the highway drive would completely deplete the battery so when I got into the city, the gasoline engine would be running pretty much the entire time that I am fighting with stop and go city traffic. However, with EV Hold mode, I can keep the battery fully charged when driving on the highway so that when I get into the city, I still have a full charge remaining so when I run into dense, slow moving traffic, I can rely on pure electric power. This allowed me to use the electric drive when it is most effective (low speeds, lots of gradual braking) while relying on the range extending gasoline engine on the highway traveling 70mph - which is the worst possible situation for the electric drive train in terms of efficiency. As was the case with the previous model year Volt EVs, the 2013 electric Chevy offers a great ride and impressive handling. The Volt isn’t going to beat up the Camaro ZL1 on a twisty road but as super efficient models go, the Volt is really very comfortable to drive whether you are speeding along the highway or carefully cutting along a curvy back road. Thanks to the superb aerodynamic properties of the Volt, there is very little wind noise even when traveling at higher speeds and while you do get some road noise echoed through the extra stiff low rolling resistance tires – it is quieter than other super efficient models with similar tires. Because of this, when you are hitting bumps on I75 at 70 miles an hour, you do feel it through the chassis a bit but the Volt is still smoother than a great many new cars on the road today. Best of all, even though the 2013 Chevrolet Volt is designed to deliver the most efficient drive possible – it still offers a great level of acceleration and a realistic top speed over 100 miles per hour. Obviously, cruising down the road at 100 miles per hour or constantly dashing from 0-60 as quickly as possible will destroy your electric range and fuel economy numbers but if you feel the need to travel at those speeds or flex the low end torque muscles, the Volt delivers. One of the beauties of these modern electric drivetrains is strong acceleration through instant torque delivery and the Volt is a shining display of that acceleration…especially when Sport mode is chosen. While acceleration isn’t bad by any means in Normal mode, selecting Sport mode provides more acceleration through significantly improved throttle response whether you are pulling away from a stop light or looking to swing out and pass slower moving traffic when traveling at higher speeds. Sport mode burns through your electric range much more quickly but if you are only driving short distances between charges, the added response of the Voltec drivetrain in Sport mode is well worth the compromised electric range. Honestly, if not for the fact that there are no engine noises during acceleration, the 213 Chevrolet Volt is peppy and responsive enough that many people wouldn’t think that it felt any different than a traditionally powered vehicle with similar power and similar size. Then again, the fact that the Volt will quickly climb to 100mph on the highway without so much as a peep from under the hood gives away the fact that you aren’t burning and fuel in the process. Since first driving the Chevy Volt several years ago, I’ve been quick to tell skeptics to drive the Volt before judging the performance of an electric vehicle and my opinion hasn’t changed one bit. 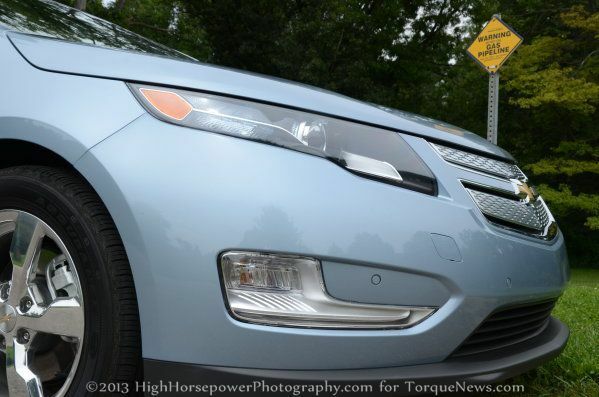 When I tested the Volt a few years ago, I was able to average 108 miles per gallon over the course of 8 days. This time around, I didn’t use a single drop of gas under normal driving circumstances. I was able to charge my Volt test car constantly when I wasn’t driving it and since my daily driving routine didn’t have me drive more than 35 miles at one time, I never ran the battery all of the way down where I needed the range extending engine. I did make one long trip (of around 80 miles) where I kept the Volt in EV Hold mode the entire time and when preserving the battery level of 39 electric miles, I averaged 40.1 miles per gallon. Skeptics will be quick to complain that 40mpg isnt very good but I should stress that this was achieved in the worst case situation which included plenty of highway and city driving with the drivetrain locked in the least efficient mode when it comes to fuel usage. The 2013 Chevrolet Volt offers unlimited electric range for someone who never drives more than 40 or so miles at one time and who has steady access to a charging station. I didn’t use any gas in 8 days of driving except for when I kept the car in EV Hold mode and when you combine that simple fact with the great driving qualities of the Volt – it is clear why this is the bestselling EV in America. I am, by no means, an EV guy. I love going fast and I love getting to those high speeds in a hurry – traits which are typically non-existent in the electric vehicle segment. However, I love the Chevy Volt. While it obviously doesn’t offer performance like the Ford Mustang Boss 302 or the Camaro SS, the Volt offers great acceleration, strong handling and an impressive top speed for a compact car…regardless of the fact that it is an EV. If the Volt performed the way that it does with a traditional drivetrain, it would still be a great car to drive but the fact that it offers the levels of performance that it does without using any gasoline makes this one impressive piece of automotive technology…and it is designed by an American automaker. High tech drivetrain aside, the 2013 Chevrolet Volt has a great exterior design that makes it look more like a “normal” car where other super efficient models have awkward, egg-like styling that many consumers find to be unpleasant. Finally, the Volt has a great looking, comfortable interior layout with tons of technology and even more space for passengers and cargo so if you are looking for a vehicle that offers great all-electric range without the concerns of range anxiety – all wrapped into a great looking package – the Chevy Volt should be the first car that you drive. Based on my experiences, driving the Volt for a while will make any EV buyer want to drive it home and put it in their garage.